It is July FIRST, time for the FIRST Blog Tour! (Join our alliance! Click the button!) The FIRST day of every month we will feature an author and her latest book’s FIRST chapter! In sixth grade, Melody Carlson helped start a school newspaper called The BuccaNews (her school’s mascot was a Buccaneer…arrr!). As editor of this paper, she wrote most of the material herself, creating goofy phony bylines to hide the fact that the school newspaper was mostly a “one man” show. Visit Melody’s website to see all of her wonderful and various book titles. Don’t miss her latest teen fiction, Stealing Bradford (Carter House Girls, Book 2). I’m not the kind of girl who wants anyone to feel sorry for her. So after my fiancé jilted me less than four weeks before our wedding date, and since the invitations had already been sent, my only recourse was to lie low and wait for everyone to simply forget. Consequently, I became a recluse. If I wasn’t at work, teaching a delightful class of five-year-olds, who couldn’t care less about my shattered love life, I could be found holed up in my apartment, escaping all unnecessary interaction with “sympathetic” friends. And that is how I became addicted to HGTV and ice cream. Okay, that probably calls for some explanation. HGTV stands for Home and Garden TV, a network that runs 24/7 and is what I consider the highest form of comfort TV. It is habit forming, albeit slightly mind numbing. And ice cream obviously needs no explanation. Other than the fact that my dad, bless his heart, had seven quart-sized cartons of Ben & Jerry’s delivered to my apartment the day after Collin dumped me. Appropriately enough, dear old Dad (who knows me better than anyone on the planet) selected a flavor called Chocolate Therapy, a product worthy of its name and just as addictive as HGTV. But now, eighteen months and twenty-two pounds later, I seem to be in a rut. And apparently I’m not the only one who thinks so. I consider this. I want to point out that Holly and I used to always go to the Cinco de Mayo celebration together–as in past tense. And despite her pity for me, or perhaps it’s just some sort of misplaced guilt because she’s married and I am not, I think the days of hanging with my best friend are pretty much over now. The image of Holly and Justin, both good looking enough to be models, strolling around holding hands with frumpy, dumpy me tagging along behind them like their poor, single, reject friend just doesn’t work for me. “So what are you doing then?” I hear the challenge in her voice, like she thinks I don’t have anything to do on a Saturday. I slump back into the sofa and look over to the muted TV, which is tuned, of course, to HGTV, where my favorite show, House Flippers, is about to begin, and I don’t want to miss a minute of it. “I’m, uh…I’ve got lesson plans to do,” I say quickly. This is actually true, although I don’t usually do them until Sunday evening. “Wrong.” Okay, Holly is only partially wrong. Fortunately, I haven’t told her about my latest flavor. “Sure,” I say quickly. “You guys have fun!” Then I hang up and, taking the TV off mute, I lean back into the soft chenille sofa and lose myself while watching a hapless couple from Florida renovate a seriously run-down split-level into something they hope to sell for a profit. Unfortunately, neither of them is terribly clever when it comes to remodeling basics. And their taste in interior design is sadly lacking too. The woman’s favorite color is rose, which she uses liberally throughout the house, and she actually thinks that buyers will appreciate the dated brown tiles and bathroom fixtures in the powder room. By the time the show ends, not only is the house still on the market despite the reduced price and open house, but the couple’s marriage seems to be in real trouble as well. “Too bad,” I say out loud as I mute the TV for commercials. Riley’s head jerks up, and he looks at me with expectant eyes. “You just keep being a good boy,” I tell him in a soothing tone. Hopefully, he’ll stretch out this midday nap a bit longer. Because once Riley starts moving, my tiny apartment seems to shrink, first by inches and then by feet. My hope for an elongated nap crumbles when his tail begins to beat rhythmically on the floor, almost like a warning–thump, thump, thump–and the next thing I know, he’s up and prowling around the cluttered living room. Riley isn’t even full grown yet, and he’s already way too much dog for my apartment. Holly warned me that his breed needed room to romp and play. She tried to talk me into a little dog, like a Yorkie or Chihuahua, but I had fallen for those liquid amber eyes…and did I mention that he’s part chocolate Lab? Since when have I been able to resist chocolate? Besides, he reminded me of a cuddly brown teddy bear. But I hardly considered the fact that he would get bigger. After he climbed into my lap that day, licking my face and smelling of puppy breath and other things that I knew could be shampooed away, there was no way I could leave him behind at the Humane Society. I already knew that he’d been rejected as a Christmas present. Some dimwitted father had gotten him for toddler twins without consulting Mommy first. Even so, Holly tried to convince me that a good-looking puppy like that would quickly find another home. But it was too late. I knew Riley was meant for me, and that was that. And I had grandiose ideas of taking him for long walks on the beach. “He’ll help me get in shape,” I assured Holly. She’d long since given up on me going to the fitness club with her, so I think she bought into the whole exercise theory. She also bought Riley his LL Bean deluxe doggy bed, which I could barely wedge into my already crowded apartment and now takes up most of the dining area, even though it’s partially tucked beneath a gorgeous craftsman-style Ethan Allen dining room set. Although it’s hard to tell that it’s gorgeous since it’s pushed up against a wall and covered with boxes of Pottery Barn kitchen items that won’t fit into my limited cabinet space. “This place is way too small for us,” I say to Riley as I shove the half-full ice cream carton back into the freezer. As if to confirm this, his wagging tail whacks an oversized dried arrangement in a large bronze vase, sending seedpods, leaves, and twigs flying across the carpet and adding to the general atmosphere of chaos and confusion. My decorating style? Contemporary clutter with a little eclectic disorder thrown in for special effect. Although, to be fair, that’s not the real me. I’m sure the real me could make a real place look like a million bucks. That is, if I had a real place…or a million bucks. I let out a long sigh as I stand amid my clutter and survey my crowded apartment. It’s been like this for almost two years now. Overly filled with all the stuff I purchased shortly after Collin proposed to me more than two years ago. Using my meager teacher’s salary and skimpy savings, I started planning the interior décor for our new home. I couldn’t wait to put it all together after the wedding. “Have you ever heard of wedding presents?” Holly asked me when she first realized what I was doing. “It’ll last a lifetime,” I assured her, just like the Karastan salesman had assured me. Of course, as it turned out, my entire relationship with Collin didn’t even last two years. Now I’m stuck with a rug that’s too big to fit in this crummy little one-bedroom apartment–the same apartment I’d given Mr. Yamamoto notice on two months before my wedding. It was so humiliating to have to beg to keep it after the wedding was cancelled, but I didn’t know what else to do. And now, a year and a half later, I’m still here. Stuck. It’s like everyone else has moved on with their lives except me. It wouldn’t be so bad if I had enough room to make myself at home or enough room for Riley to wag his tail without causing mass destruction…or enough room to simply breathe. Maybe I should rent a storage unit for all this stuff. Or maybe I should move myself into a storage unit since it would probably be bigger than this apartment. As I pick up Riley’s newest mess, I decide the bottom line is that I need to make a decision. Get rid of some things–whether by storage, a yard sale, or charity–or else get more space. I vote for more space. Not that I can afford more space. I’m already strapped as it is. Kindergarten teachers don’t make a whole lot. I feel like I’ve created a prison for myself. What used to be a convenient hideout now feels like a trap, and these thin walls seem to be closing in on me daily. Feeling hopeless, I flop back onto the couch and ponder my limited options. Then I consider forgetting the whole thing and escaping back into HGTV, which might call for some more ice cream. But that’s when I look down and notice my thighs spreading out like two very large slabs of ham. Very pale ham, I might add as I tug at my snug shorts to help cover what I don’t want to see, but it’s not working. I stare at my flabby legs in horror. When did this happen? I stand up now, trying to erase that frightening image of enormous, white thunder thighs. I pace around my apartment a bit before I finally go and stand in front of an oversized mirror that’s leaning against the wall near the front door. This is a beautiful mirror I got half price at World Market, but it belongs in a large home, possibly over a fireplace or in a lovely foyer. And it will probably be broken by Riley’s antics if it remains against this wall much longer. But instead of admiring the heavy bronze frame of the mirror like I usually do, I actually look into the mirror and am slightly stunned at what I see. Who is that frumpy girl? And who let her into my apartment? I actually used to think I was sort of good looking. Not a babe, mind you, but okay. Today I see a faded girl with disappointed eyes. Some people, probably encouraged by Holly, a long-legged dazzling brunette, used to say I resembled Nicole Kidman. Although they probably were thinking of when Nicole was heavier and I was lighter. Now it’s a pretty big stretch to see any similarities. To add insult to injury, Nicole has already hit the big “four o,” whereas I am only thirty-two. Her forties might be yesterday’s twenties, but my thirties look more like someone else’s fifties. And I used to take better care of myself. Okay, I was never thin, but I did eat right and got exercise from jogging and rollerblading. Compared to now, I was in great shape. And my long strawberry blond hair, which I thought was my best asset, was usually wavy and fresh looking, although you wouldn’t know that now. It’s unwashed and pulled tightly into a shabby-looking ponytail, which accentuates my pudgy face and pale skin. Even my freckles have faded. It doesn’t help matters that my worn T-shirt (with a peeling logo that proclaims “My Teacher Gets an A+”) is saggy and baggy, and my Old Navy khaki shorts, as I’ve just observed, are too tight, and my rubber flip-flops look like they belong on a homeless person–although I could easily be mistaken for one if I was pushing a shopping cart down the street. Then, in the midst of this pathetic personal inventory, my focus shifts to all the junk that’s piled behind me–the boxes, the myriad of stuff lining the short, narrow hallway and even spilling into the open door of my tiny bedroom, which can barely contain the queensize bed and bronze bedframe still in the packing box behind it. If it wasn’t so depressing, it would almost be funny. I just shake my head. And then I notice Riley standing strangely still behind me and looking almost as confused as I feel. With his head slightly cocked to one side, he watches me curiously, as if he, too, is afraid to move. This is nuts. Totally certifiable. A girl, or even a dog, could seriously lose it living like this. Or maybe I already have. They say you’re always the last to know that you’ve lost your marbles. “It’s time for a change,” I announce to Riley. He wags his tail happily now, as if he wholeheartedly agrees. Or maybe he simply thinks I’m offering to take him on a nice, long walk. “We need a real house,” I continue, gathering steam now. “And we need a real yard for you to run and play in.” Of course, this only excites him more. And that’s when he begins to run about the apartment like a possessed thing, bumping into boxes and furnishings until I finally open the sliding door and send him out to the tiny deck to calm himself. After he settles down, I go and join him. It’s pretty hot out here, and I notice that the seedling sunflower plants, ones we’d started in the classroom and I’d brought home to nurture along, are now hanging limp and lifeless, tortured by the hot afternoon sun that bakes this little patio. Just one more thing I hate about this place. So much for my attempt at terrace gardening. I’d seen a show on HGTV that inspired me to turn this little square of cement deck into a real oasis. But in reality it’s simply a barren desert that will only get worse as the summer gets hotter. I feel like I’m on the verge of tears now. It’s hopeless. This is all wrong. On so many levels. This is not where I was supposed to be at this stage of the game. This is not the life I had planned. I feel like I’ve been robbed or tricked or like someone ripped the rug out from under me. And sometimes in moments like this, I even resent God and question my faith in him. I wonder why he allows things like this to happen. Why does he let innocent people get hurt by the selfishness of others? It just doesn’t make sense. And it’s not fair. Oh, I’ve tried to convince myself I’m over the fact that my ex fiancé, Collin Fairfield, was a total jerk. And I try not to blame him for being swept away when his high school sweetheart decided, after fifteen years of being apart, that she was truly in love with him. I heard that the revelation came to Selena at the same time she received our engraved wedding invitation, which I did not send to her. She wasn’t even on my list. And I actually believe that I’ve mostly forgiven Collin…and that sneaky Selena too. And I wish them well, although I didn’t attend their wedding last fall. A girl has to draw the line somewhere. But all that aside, this is still so wrong. I do not belong in this stuffy little apartment that’s cluttered with my pretty household goods. I belong in a real house. A house with a white picket fence and a lawn and fruit trees in the backyard. And being single shouldn’t mean that I don’t get to have that. There must be some way I can afford a home. Of course, I’m fully aware that real estate isn’t cheap in El Ocaso. It’s on the news regularly. Our town’s prices certainly aren’t as outrageous as some of the suburbs around San Diego, but they’re not exactly affordable on a teacher’s salary. I try not to remember how much I had in my savings account back before I got engaged and got carried away with spending on my wedding and my home. That pretty much depleted what might’ve gone toward a small down payment on what probably would’ve been a very small house. But, hey, even a small house would be better than this prison-cell apartment. And that’s when it hits me. And it’s so totally obvious I can’t believe I didn’t think of it sooner. I will become a house flipper! Just like the people on my favorite HGTV show, I will figure out a way to secure a short-term loan, purchase a fixer-upper house, and do the repairs and decorating myself–with my dad’s expert help, of course! And then, maybe as early as midsummer, I will sell this beautifully renovated house for enough profit to make a good-sized down payment on another house just for me…and Riley. Even if the secondhouse is a fixer-upper too, I can take my time with it, making it just the way I want it. And it’ll be so much better than where I live now. I’m surprised I didn’t come up with this idea months ago. It’s so totally simple. Totally perfect. And totally me! “We are going house hunting,” I announce to Riley as I shove open the sliding door and march back inside the apartment. His whole body is wagging with doggy joy as I quickly exchange my too-tight shorts for jeans and then reach for his leather leash and my Dolce & Gabbana knockoff bag–the one I bought to carry on my honeymoon, the honeymoon that never was. I avoid looking at my image in the big mirror as we make a hasty exit. “Come on, boy,” I say as I hook the leash to his collar at the top of the stairs. “This is going to be fun!” And since this outing is in the spirit of fun, I even put down the top on my VW Bug, something I haven’t done in ages. Riley looks like he’s died and gone to doggy heaven as he rides joyfully in the backseat, his ears flapping in the breeze. Who knows, maybe we’ll find a house for sale on the beach. Okay, it’d have to be a run-down, ramshackle sort of place that no one but me can see the hidden value in, but it could happen. And while I renovate my soon-to-be wonder house, Riley can be king of the beach. The possibilities seem limitless. And when I stop at the grocery store to pick up real-estate papers, I am impressed with how many listings there are. But I can’t read and drive, so I decide to focus on driving. And since I know this town like the back of my hand, this should be easy. But thanks to the Cinco de Mayo celebration, the downtown area is crowded, so I start my search on the south end of town, trying to avoid traffic jams. I’m aware that this area is a little pricey for me, but you never know. First, I pull over into a parking lot and read the fliers. I read about several houses for sale, but the prices are staggering. Even more than I imagined. Also, based on the descriptions and photos, these houses already seem to be in great shape. No fixer-uppers here. Then I notice some condo units for sale, and I can imagine finding a run-down unit in need of a little TLC, but it’s the same situation. According to the fliers, they’re in tiptop, turnkey shape–recently remodeled with granite counters and cherry hardwood floors and new carpeting and prices so high I can’t imagine doing anything that could push them a penny higher. My profit margin and spirits are steadily sinking. Maybe my idea to flip a house has already flopped. Just like the rest of my life. 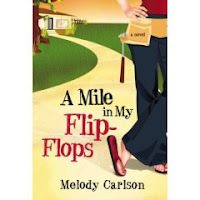 Excerpted from A Mile in My Flip-Flops by Melody Carlson Copyright © 2008 by Melody Carlson. Excerpted by permission of WaterBrook Press, a division of Random House, Inc. All rights reserved. No part of this excerpt may be reproduced or reprinted without permission in writing from the publisher.